The photo to the right shows a typical concrete tile roof found all over Trabuco Canyon. Concrete tile roofs come in three basic shapes or styles. The one shown is called a flat tile, there’s also an “S” tile shaped roof that resembles Spanish tile because of its high and round curves, and there’s the less popular low rise tile that is best known for its two or three very slight humps that somewhat resembles a meditation look. 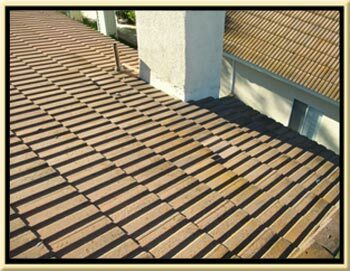 The roof install for all tile is basically the same but the roof repair techniques necessary to repair a roof leak will be different for different areas of the roof. Typically when I am called out to inspect the roof due to a roof leak I will go up on the roof and see what you see above. 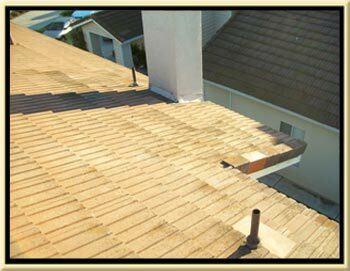 For this roof inspection I didn’t see any broken tiles and there weren’t any immediate concerns to report to the home owner who is often sure that there must be a broken tile or something small causing the roof problem or leak. As in this case of a leak coming in from around the fireplace the problem is not what you can see but it is what you can’t see. After coming down from the roof and knowing there is nothing obvious that needs to be repaired I have to inform the home owner that I will need to do roof leak detection in that area of the roof. This will involve a very skilled roofer carefully removing a significant amount of tile and felt on the roof in that area in order to fully uncover the leak source and the full extent of the damaged or leaking roof. Now don’t bother mentioning leak detection this to other roofers because they won’t know what you’re talking about. 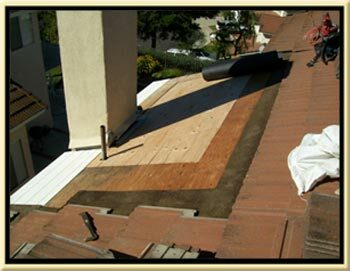 Most roofers have no idea what is going on with your roof or what the extent of the leak damages are. If you listen to them they will give you hints that this is true by what they say. From what I am told they will tell you it could be this or it could be that, sometimes they tell you it’s a small problem so they can open up your roof, take some pictures of the big problem they uncovered, and then they use their camera to saddle you with HUGE price increases. While these roof repair price increases may be justified I bet you would wish you were dealing with someone who could tell you upfront about the possible roofing problems that could be uncovered and not just try to low ball you then pull the bait and switch technique. Believe it or not but a lot of roofers don’t like to remove the old roofing felt. 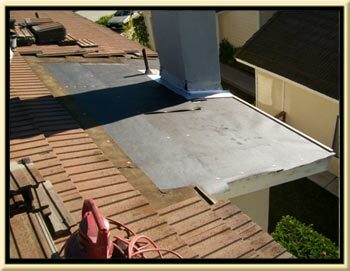 They feel you can just go right over it and save the costs and it is easier to sell you a cheaper roof repair option. Doing a roof repair like we do is a lot more time consuming than just removing some tiles and inserting some felt where you “think” is the roof problem is and then collecting a check from the home owner. As you can see from the photo this roof and most roofs have a lot more problems than you would think when the roof starts leaking. All of the water intrusion damage you see to the plywood and decking was only resulted in a small water stain on the ceiling of the master bedroom. Several roofers had told this customer that they could simply caulk the chimney for $150-250 and see if that does it. Well, let me tell you that almost never fixes a chimney, fireplace, or skylight leak. If this customer would have hired one of those guys who does a cheap leak repair all this damage would have never been revealed. Mold damaged wood and insulation should be carefully removed and repaired to insured safe air quality of the residents. The photo shows how your roof deck should look before any waterproofing starts. Removing the roofing paper and putting new felt paper down is only half the job. If your roofer doesn’t do any wood repair you better hope you can trust him or chances are he just buried some dry rot or termite infested wood and it will cost you double to get it out. 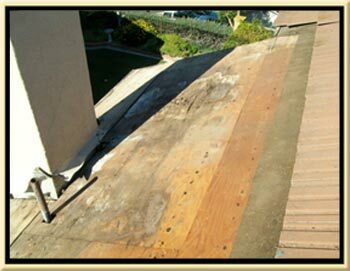 The bottom line is any dry rot or termite damaged eave board, fascia, or plywood needs be replaced at this time. If you’re thinking every roofer is going to do this for you are mistaken. The wood work part of a roof repair is not only sometimes unexpected but it can be a major hassle and it will slow down the job. There may be painting involved and chances are the roofer is not set up or experienced enough to anticipate or want to do that. Also, this requires an additional conversation about repair costs. If the roofer thinks he has already maxed out his charges he may just ignore the dry rot or termite damaged and cover it up. As you can see there will be many reasons for the roofer not to bring this up and none of them benefit you. Rest assured if you hire us that our tile roof repair prices are extremely competitive and we try to be thorough and up front about any potential fees above and beyond the initial roof repair estimate. We want you to be a happy and satisfied customer of ours for years to come. We have two standard roof warranties we can offer. One is a three year and one is five year roof repair warranty. There’s a small price increase for the five year and we also use an additional roofing waterproofing products with the five year roof repair warranty. The product as shown in the photo is a premium 50 years warranted Ice and Water Shield for roofs. Water shield is an excellent innovation for roofing and we use it around all the critical flashing areas such as a chimney, fireplace, skylight, valley, tin runs and some other areas around your roof. 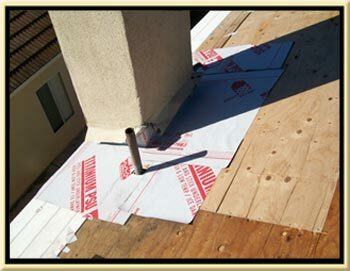 This product provides additional water proofing protection to these critical flashing areas on your roof. 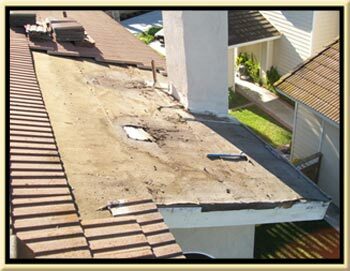 Remove all damaged roofing felt. Remove and replace dry rot damaged eave board and plywood. Clean the roof deck and pound down all protruding roofing nails (most roofers do a bad job of this “if” they do it at all). Install water shield around leaking chimney, fireplace, or skylight. The photo shows the finished repair with everything cleaned up, all broken tiles replaced, and all original tiles put back in just as they were. We are a licensed and insured C-39 Roofing Contractor that specialize in the repair and replacement of all types of roofing including: Steel, Spanish, Concrete, Tile, Lightweight, Composition, and slate roofs.